All Replies on WOODWORKING TV SHOWS WHAT DO YOU LIKE BEST ABOUT THEM ? WOODWORKING TV SHOWS WHAT DO YOU LIKE BEST ABOUT THEM ? Jim, I have not watched a woodworking show in I would guess 5 plus years. I enjoyed the few episodes of New Yankee and The Woodwright but I was not doing woodworking at the time I saw them. I saw a couple of episodes of Rough Cuts (on the web not TV) and did not enjoy the ‘artificiality’ of the ‘big’ production show. I like when podcasters or YouTubers create great content on any topic under the sun. I would trade ‘professional’ for quality content and accessibility any day. Norm’s show was frustrating in that it was soooo easy for him to create these elaborate projects and never made any mistakes so never showed how to recover from one. Woodright shop had good pacing and a more approachable style but I never did get to see more than a few before they started being shown on the internet. I like Stumpy Nubs, Marc Spaganolo, Jimmy Diresta and a host of other folks that are essentially one man shows, or at least very small teams, when it comes to production and content creation. There is no way PBS or any other network could touch the variety and volume of material these folks put out, it reminds me more of the days when radio and TV stations were local concerns broadcasting to their local market, not a homogeneous media blob coming from ‘far away’. Well I will get off my soap box now, that’s for posting this interesting topic. You should get a lot of responses here, especially from the ”Old Timers” LOL! Since I was primarily doing house repair and building Norm, This Old House “Tommy Silva” always gave me inspiration. “I wanna be like Norm” ???? Sold a lot of Delta, and Craftsman stuff ‘cause Norm used it. Norm was detailed and simple even if scripted. And he chose methods and projects that fit the do it yourselfer. I think identifying with the host was important. I like that women are Makers and Woodworkers now. Woodworking now is internet driven and content as well as host centered. Norm was the master of creating envy in both tools and shop. And now tool manufacturers are following suit on the internet. It should be an interesting topic. I don’t think I’ll ever buy another tool and all that buddy-buddy stuff doesn’t interest me much. I like seeing the big shops, learning tips, and just watching how they build a project. I’ve watched them all, from time to time. 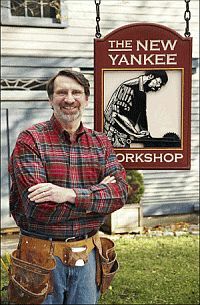 Norm Abram was a favorite for efficient use of power tools and basic joinery techniques. David Marks taught me to pay attention to figure and finish. I miss his show more than any of them. I still watch Roy Underhill from time to time, just for the love of wood and use of hand tools. Tommy Mac is OK, but he doesn’t do anything that I’d learn from. Same for Woodsmith. I’ve built dozens of woodsmith projects over the years, but all before the TV show. The TV show is “too produced” for my taste. I still make an effort to watch This Old House, as I’m pretty much always doing some sort of home improvement project and they usually show the latest and greatest materials and technologies. everything I don’t know LOL Charles is my go-to guy too.Thanks for your kind words. I think the biggest thing is that it’s a topic that interests me so I enjoy most all of the shows. I started with TOH and Norm in late 80’s. I still enjoy TOH, Ask TOH and Woodsmith. Lately the YouTube channels have been my main go to. Some are informative, some are entertaining and some both. Tom Fidgen is probably one I’ve enjoyed most since Norm. Hi Jim, Roy is still my all time favorite. Norm was interesting and so were Tommy Mac and the Woodsmith shop. I haven’t watched many online. Those were on the local PBS station. I have Woodsmith cds and watch them for the how-to aspect. I had no woodworking background when I got started a few years ago and so I needed the instruction that most on this site would find boring or basic. I view youtube videos as well when I have a chance (Wood Whisperer, WWMM Steve Ramsey, and others). Then I found LJ and have learned much from just reading through responses to questions and viewing projects. Also a fan of This Old House. So, to answer the question…A is the main reason and then also a bit of D.
I am a woodshow junkie and for that matter i would choose PBS over just about any content on TV. For me I learned techniques from watching these shows. I have watched all my life but never really had a chance to outfit a shop and start working until about a year ago. I also liked how just about every project Norm did started with a look at the antique original. I had a chance to visit August Home publishing in DesMoines once. This was before the woodsmith TV show. They teach some really solid techniques. Scott Phillips I also enjoy although someone needs to take away his Kreg jigs. Tommy is a real artist but he needs to take about 10 shows to go into the details of some of the finer projects he makes. There once was a show i used to watch where two guys made everything using just routers. Good topic! I have enjoyed and learned from many of the shows. As my woodworking knowledge has grown (some as a result of the shows, some from experience and some from the internet) how I watch the shows has changed. I’m better able to perceive sales spiels, prize the historic background and understand the problems presented. I get a lot now from this website and several YouTube channels. The most recent treasure I’ve found is LJ Paul Sellers YouTube channel. If you haven’t seen his videos, I highly recommend you give them a look. My all time favorite is still Norm. He had charisma and the perfect show format. His antique visits were the weakest part of the show but they were relevant to what he built (kinda usually). Norm had a knack for putting the steps in a logical sequence and telling you why he was doing things, which what I enjoyed the most. The show had a lot of variety too. Close second is The Woodwright’s Shop. Roy has good showmanship and is well educated in the arts. I enjoy it when he uses woodworking to pontificate about history or philosophy, or relates history to his project. I also appreciate that Roy led the way to preserve hand tool woodworking against the juggernaut that was Norm + Delta. Third would be Tommy Mac who sort of copied New Yankee Workshop but isn’t as logical or organized as Norm. Tommy’s projects are among the most complex I’ve seen on any tv show and I respect that. He is definitely a well educated and talented craftsman. I believe the weaknesses in his show, including the manic pace, are the fault of the producers and not Tommy Mac. There are also quite a few youtube woodworking channels that are entertaining and sometimes educational. Great topic Jim! I like them all but my favorite is/was The New Yankee Workshop. My dad is a diy’er and watched it so we all had to watch it. When I was a kid I was the remote and we only had 4 channels, PBS being one of them. Lol. I remember thinking if that goof ball , Norm, could do that then I surely could. Lol! Now Norm has gone from “goofball” to “The Man” in my opinion. Back to your question, all of the above. I like it all. I would add a couple more that may or may not make any sense, nostalgia and peaceful. Like right now I’m thinking of those shows mentioned throughout this topic and can’t stop smiling, good stuff. always enjoyed watching Norm. it was nice seeing him visit different projects and have experts craftsmen show their techniques and hints. i remember always thinking, man, if i had all those nice tools…. I liked Norm for the how to.. and I enjoy This Old House. I Build It, The Wood Whisperer and WWMM are some of the best. I still watch and enjoy the older New Yankee Workshop episodes and the current & past Woodwright episodes. Those two show ordinary projects being constructed without extraordinary shops or tools. Tommy Mac is fun in the projects he does and the field trips he takes. Beyond that, I find more helpful information on YouTube more so than anywhere else. Shop envy is something I don’t have, in fact I believe it sends the worst message possible to aspiring or even remotely interested would be wood workers as the vast majority of the time the project being produced can be done so in a far more modestly equipped shop while only sacrificing as little on the completion time. For me it’s far more captivating watching someone do more with less than less with more! Even being one of the less seasoned guys on here, I grew up watching Norm and the This Old House crew. I guess for me the best part was watching something go from a few boards to a fine piece of craftsmanship. As for the tool envy, it’s definitely there, but if you go back to the first season of NYW, Norm really didn’t have an absurd amount of expensive tools: a few basics, and he made jigs as he needed them to fill in the gaps. From my perspective, that’s what made woodworking seem like an attainable goal for a hobbyist. If not for that, I don’t know if I ever would have gotten into it. I favorite 3 in no particular order are Woodsmith, Woodwright and Tommy Mac. For Woodsmith I think they do a really good job in the details of how they build the project, and don’t leave out much. I also like how they occasionally take a certain tool and really dive into all the things you can do with it and show all the jigs you could make to really get a lot of use out of certain tools. The problem I have with them is they act like hand tools are this mystery nobody uses any more. They showed a shooting board with a block plane this season like it was this mystic tool nobody had ever seen. It drives me nuts because I know Phil is a hand tool guy, I’ve seen him wandering around Handworks before. I just recently discovered Roy thanks to lumberjocks. We didn’t get him on PBS where I have lived and so I’ve been watching him online. I really enjoy his enthusiasm and seeing all these crazy tools I had no idea existed. The problem with Roy is he always seems like he’s running a race and doesn’t slow down to explain the detail of how he’s doing something. Tommy Mac I really like. That guy is an amazing craftsman. He really strikes a good balance between power tools and hand tools. If I had to guess I’d say 80% of the people on this website fall into that category of guys who use a bit of both. The only complaint I have is I wish he’d take some of those more complex projects and stretch them out over more episodes to really dive into what he’s doing. Lots of great input guys so far it seems like the internet is to some degree favored over TV then followed by Norm. 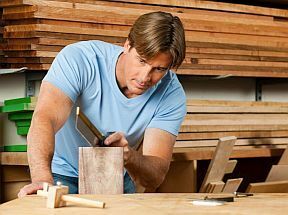 Do you think who’s favored on TV has to do with the viewers age or their experience in woodworking or both? Another Roy fanboy here. Obviously his skill and experience is hard to match but the show seems more honest than most, and his theatre background I think helps make it enjoyable. There are other shows where I have to force myself to look past the host’s ‘personality’ and the ‘production’ to enjoy seeing what’s being built, and how. Recently I’ve discovered a youtube channel “See Jane Drill” which is excellent on simple home improvement stuff. I began building things at the age of eight in 1948, read all the magazines about model airplane building and Mechanics Illustrated, Popular Science, etc. No TV how to shows then! Later it was Roy Underhill’s show which I still think is the best. Now that I am 76 years old I’ve pretty much seen it all and done it all from metal working and woodworking. Looking back on it, I have most enjoyed the “how to” shows that challenged my skills and dreams! Things that were beyond me presently but I aspired to. The problem I have with the present woodworking shows is they are all the same. They deal with basic woodworking and are uninspiring. We need some shows that tackle advanced subjects like veneering, carving, sculpting, unusual finishes, etc. I remember having lunch with the editor of Fine Woodworking magazine a few years back telling him there are other things made of wood than furniture and stating that I had quit reading Fine Woodworking as I wasn’t being challenged any more. He wasn’t interested in hearing it. Any way, that’s my say so. Jim, I would think both. Admittedly Norm probably didn’t have the demographic information that Tommy’s crew does today to try to keep the viewer’s interest but what he did have was a tremendous knowledge and capability, not withstanding he had one of very few wood working shows back then. The roots of how the show was in the beginning are what earned the show the respect it still has today, very humble beginnings much the same way most new wood workers would start out today. In the last few years I’ve changed preference in what I like watching before it was I’d just watch everything now I only really like The Woodwright because it just feels more natural and he actually takes his time and shows you each step and it doesn’t always happen perfectly, Roy just kinda goes with it. I also like Roy’s guests more especially him and Schwarz as they seem like a couple of kids just having a good time which is what this is supposed to be. I don’t like Rough Cut his show has become way to streamlined and hugely just marketing, The Woodsmith Shop is still alright every now and then they’ll have a jig that is handy and they aren’t annoying to listen to. Norm’s show isn’t on anymore where I am and other than that all I get is TOH which I like because I do alot of the work on my house and I like Tom Silva. I ll weigh in here. I began building things at the age of eight in 1948, read all the magazines about model airplane building and Mechanics Illustrated, Popular Science, etc. No TV how to shows then! Later it was Roy Underhill s show which I still think is the best. Now that I am 76 years old I ve pretty much seen it all and done it all from metal working and woodworking. Looking back on it, I have most enjoyed the “how to” shows that challenged my skills and dreams! Things that were beyond me presently but I aspired to. The problem I have with the present woodworking shows is they are all the same. They deal with basic woodworking and are uninspiring. We need some shows that tackle advanced subjects like veneering, carving, sculpting, unusual finishes, etc. I remember having lunch with the editor of Fine Woodworking magazine a few years back telling him there are other things made of wood than furniture and stating that I had quit reading Fine Woodworking as I wasn t being challenged any more. He wasn t interested in hearing it. Any way, that s my say so. I am a bit more senior to you (82) and I see where you are coming from. I too started wood and metal working at a very early age because that’s what kids my age did back then; no TV, just a few magazines and the library. Magazines like Popular mechanics, Popular Science and Science and Mechanics provided a wealth of information for young, curious minds. Magazines today are a laugh. They don’t provide any challenges that the magazines of the 30’s and 40’s did. The TV shows of today, and that’s just what they are, “shows” do nothing to inspire future wood workers. They are merely avenues for advertising, nothing more. Other than NYW and David Marks, there is little to be gained by experienced “old timers” like us. I could go on and on about how it was so much better for kids growing up during the mid 20th century, but I won’t. I have watched some woodworking shows, but I have never learned anything that was new to me. If anything, a tip on a show would make me remember something I knew, but forget. The shows are geared to the beginners as entertainment and for selling products. Why Do I watch them at all? Because there may not be anything better to watch or I can’t sleep. You said it Mr. Ron!!! The old Router Workshop. I think I bought a router in part because of watching it being actually used on this show. I saw him change bits, explain how it worked, everything. For a while I tried to do everything possible with a router. They even had sawdust on the show. The second is Rough Cut. While I can see why some folks don’t like the high production, I appreciated that he used hand planes and dovetail joints. I liked watching how he chose wood and thought through the project. Compared to the contemporaneous woodworking shows, I felt like Tommy Mac elevated my woodworking from thinking about pocket screws and HD red oak to rough cut (literally) hardwoods and starting from scratch. I’ve watched a few woodworking shows and have never seen one I didn’t enjoy. However, my biggest problem would be scraping up the time necessary to watch them on a regular basis. So far as education is concerned I like Charles Neil the best. I also like New Yankee Workshop and Roy Underhill. I also belong to several woodcarving sites that teach by videos. Lack of free time is a big problem. I liked New Yankee workshop. Norm was just good. From a magazine article, he made them all twice. Once to work through plans and any issues and the second while being filmed. He concentrated on planning and process to reduce mistakes. And while yes, he had a nice shop setup, he never made a big deal out of them and had shows from time to time on reduced tool setup, but his show had a target audience and he fulfilled it well. The Woodwright – Roy Underhill – Source of general knowledge and processes using older tools and techniques. I often enjoy his guests. I understand that his shows are all shot in one take and ‘done’. Don’t always like his humor but that’s what it is. Woodsmith – I check it out. If they are covering something I am unfamiliar with then I watch it to see if I can learn something. Tommy Mac – I like him. He paces his show uses a mix of tools and techniques and has guests with different approaches. This last season is ‘building his shop/house improvements’ which makes me slightly envious, but he still says, you can do all the stuff without the fancy tools and it’s a lot of informative approaches as well. The American Workshop. I watch this one because he does a variety of different things. Sometimes he re purposes old stuff, other times, he does new things. I’ve seen complaints about his attachment to krieg jigs but honestly, I watch to see new things that I don’t do or know how to do. 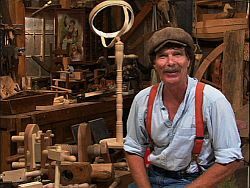 My PBS doesn’t have Tim Yodar on anymore (Wood Turner), but I found him on YouTube so I check him out there. Now. I don’t always agree with something some of these folks do, but I often learn about things I didn’t know or haven’t been exposed to previously. This is often less expensive then me randomly doing things. Given the time constraints these shows operate under (22ish minutes total production time) they still manage to cram a ton of stuff in them. Most of my video viewing is various YouTube folks now. Some for projects they do, some because they put on a good show, some because they have interesting approaches that I think I can learn from. I like them all. I simply like that woodworking is still publicly represented that way. I like programs that demonstrate skills as part of a project. When you show the skills as a natural part of the building process it is easier to digest. Watching an interview with Norm, he said that New Yankee Workshop employed several woodworkers who did most of the work, built the prototype and did most of the finishing. Love all the shows I can watch, a few I could take or leave. My go to shows are Woodsmith shop, Rough cut and this old House. There are things that I don’t care for on Woodsmith or Tommy’s but I understand there is a big audience out there and some things are needed. The guys on this Old House especially Mr Silva are Amazing. Ohh and I cant forget Holmes on Holmes. little drama but the work and repairs are spot on. I’ve always enjoyed Roy Underhill, but now I find the little guys on you tube get nearly all of my attention. How it’s made, although its not just about wood working is a good show. You can actually see things being put together along the assembly line. What I see are different ways to put something together that just might come in handy in my hobby. I read an article by I believe Fine Woodworking that said he did the work himself. One version to build out, test the plan and pace the build. The second was for the show and book since the show started out as a companion for the books. Do you think who s favored on TV has to do with the viewers age or their experience in woodworking or both? Hard to say on this one. My best friend, with whom there is less than a two year age gap, watched Roy all the time growing up, while I watched Norm. I’ve been a hobbyist woodworker for about 5 years, whereas he just picked it up. The difference is I have the power tools, and he’s gotten into carving. Seems about right, based on our preference of shows. Oh, and for all the Roy Underhill fans out there, there’s a TEDx talk he did on youtube. Per usual for Roy, it’s quite entertaining. I watched that. One of comments said something like “Like Gallagher with wood” because the ax shaving/chips kept spraying the audience. Oh, and for all the Roy Underhill fans out there, there s a TEDx talk he did on youtube. Per usual for Roy, it s quite entertaining. Like most of us, I began with watching Norm, seeing him move from a contractors saw to a shop with a huge Timesaver drum sander over the years. I liked the stuff he did, simple enough but as I learned I started to cringe when ever he would wet-rag a glob of glue or break out the pneumatic nailer (pffffat, pffffat, pffffat….). Of the current shows, Rough Cut is ok, Tommy is kind of annoying but the information he presents is good, with little repetition. His smearing of glue squeeze out is probably my biggest gripe. Woodsmith has to be the most over-produced show. My wife calls them the “Mom’s basement dwellers”. I do pick up on some useful tips and enjoy criticizing some of their techniques. A bit too much “dumbing down” and repetition in my opinion, but I hope they stay around. I do miss David Marks (my favorite). He made the kind of stuff that I’d like to try. Basically everything he did was the “next level”. His smearing of glue squeeze out is probably my biggest gripe. in the grand scheme of things, seems like a pretty minor gripe. Mainly I like the “How to” parts. When the shows turn into a show that is trying to sell stuff…..I turn the show off. Learned a lot from Norm, and my uncles. Was in the Carpenter Trade for a while, too. Lately, it has been either Roy Underhill, or Paul Sellers. Show me HOW to do a task, but do NOT try to sell a “Must have tool” to do it. Unless I’m looking for something specific, I don’t watch much internet WW. Most of it needs about 2/3 edited out. Did anyone happen to catch roughcut today? Its the first show since Tommy got his new shop set up. Holy cow he really went production with all SCM. I don’t think he even knows how to use some of the stuff hes got in there. His table saw is a “combination machine” He had the SCM guy as a guest and he was showing him how to use it. There is a four foot wide belt sander. They haven’t started the new season here. Tommy Mac is my guy and now he’s available on line. What I really like about his live posts is they are real. An occasional cuss word. He smokes a cigar on air. Shows his mistakes. It absolutely is not high quality video. Hell, he’s his own cameraman. And up till now he’s using his I-phone as his camera. Also he has moved from that huge beautiful shop to a shop he built in his back yard. Two story, but very small. And if you have read up on his life’s story you can better appreciate where he came from. Actually, Randy Tommy Mcdonald was online a few years before he got his PBS show that’s where the PBS folks found him. I do a lot of Utube watching if that worthy of mention.